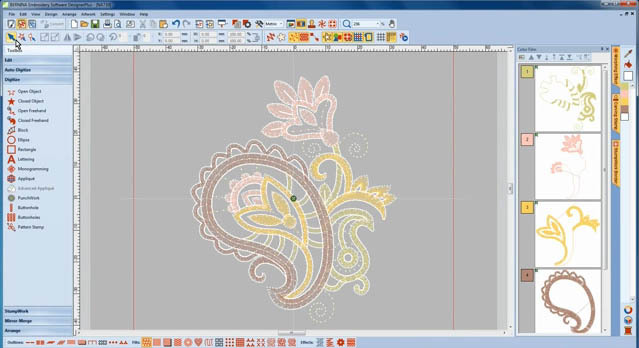 Bernina Embroidery Software 7 – It’s Here! I’ve been in training the past couple of days learning Bernina’s new embroidery software…Software 7. Here’s the verdict. I love it. And believe me, if I didn’t love it, this blog would be about something else! My first impression was that the new interface with its bright colors and larger icons made the software feel remedial — like entry level stuff — when we all know this digitizing software is probably the most complete consumer embroidery software on the market. As I played around, I found all my “usual” icons in places that are far more intuitive than they were before. I think beginners will have a much easier time understanding all the capabilities of this software. –More single run lettering capabilities and fonts which will be perfect for quilt labels, recipes etc. Overall, the improvements were easy to figure out and to use. That’s the hallmark of good design…when you “get it” right away. I was able to load Software 7 on the same computer as Version 6, but most of you will want to simply update. I can’t wait to spend a little time working on projects. FYI, Bernina’s Software Sampler will continue to focus on Version 6 until the end of the year, at which point everything will be focused on Software 7. Here’s a video provided by Bernina that will give you an overall idea of their new Software 7. This entry was posted in Creativity, digitizing, embroidery, machine embroidery, quilting and tagged Bernina Embroidery Software 7 by edges. Bookmark the permalink.